Capetta and McCarthy have crafted a fantastic novel weaving the legend of King Arthur with the majesty of space in a crossover sci-fi masterpiece. Ari is a refugee, the only person she knows from the planet Ketch, which was sealed off by the ruling power of the universe, Mercer. Mercer is a company which deals in all manners of trade, controlling everything including water and food supplies to the planets which were settled by humans. As such, they have the ultimate power, which is not wielded for good. Ketchans were complaining about Mercer and their unethical practices when Mercer sealed off the planet. As the only Ketchan known to be outside the seal, Ari is the most wanted person in the universe. Ari was found in a spaceship wreckage when she was a child and adopted by Kay’s mothers. They have since lived off the grid as much as possible to avoid being found by Mercer. Since then, their mothers have been imprisoned by Mercer and Ari and Kay are evading them on their own. In an attempt to escape from Mercer, Ari and Kay crash onto Earth, which is now an abandoned conservatory. When Ari finds and pulls a sword (Excalibur) from a tree, she unwittingly wakes Merlin, who is now in his adolescence (still aging backward) and tells her that she is the 42nd incarnation of King Arthur. Merlin is on a quest to do what he has failed with the first 41 Arthurs- train Arthur, defeat evil, and unite the universe in peace. As they gather Ari’s friends, Merlin helps us to identify the reincarnated versions of the knights of the round table- and of course, Gweneviere, whose romance has been a problem for past Arthurs. Morgana also makes appearances as a ghost-like form with some powers, interfering with the Arthurs over time and currently. However, everything is sure to be different time, beginning but certainly not ending with the fact that Arthur is now female, and Merlin is desperate to try anything to prevent the cycle from needing to be repeated. What I loved: First and foremost, there’s the diversity in this retelling. Morgana identifies Ari as being of Arab descent, and the other characters are also of various ethnicities. The sexual orientations and gender identities of the main characters are also varied. The authors weave in a lot of comedy amongst the action/adventure that bring a light-hearted spin amongst the serious themes of the book. There is a lot to consider in this book, beginning with the powers held by companies who control trade and the value/consequences of dissent. Mercer claims to be neither good nor evil, but they make business decisions which can be certainly viewed one way or the other and thus raise questions of the powers companies should be allowed to hold and how they should be regulated (there are no checks and balances here). There are also the issues of refugees and the power of truth when it is easier not to listen. These important issues add some potentially great discussion points to this YA fantasy/sci-fi. This book is absolutely chockfull of lovable and engaging characters, beginning with Ari and Merlin and continuing to the misunderstood Morgana and the other knights. Jordan plays a side role, but she really grows as a character, and I would love to see more about her in future books. Adding to this, Lamarack and Val are interesting characters who have a slightly bigger role, but are also people I would love to get to know more in future books. While this book easily could have been a dark and serious story, it is infused with unexpected comedy. I found myself laughing along throughout with the characters and their perspectives. While there are some serious scenes, the overall tone is very light with good doses of humor. What left me wanting more: Merlin seemed to be the primary narrator in this book. While we get other perspectives (primarily Ari’s), his seems to dominate. As such, I felt less connected to the romance that Ari has than that of Merlin. As Ari’s romances have further reaching consequences, I would have liked to delve deeper into these emotions and felt more connected to the relationship. However, there is a lot going on in the story, and so it would be hard to really get into all the aspects presented in this novel. Primarily, I wished there was more background/building for the many relationships (both friend and romantic) and the history of how the universe came to be this way (we do get some hints/pieces throughout, enough to build a pretty good picture by the end). As this is the first in a series, I assume future books will have more. Getting deeper into this fascinating world and these exciting characters would be the icing on the cake. 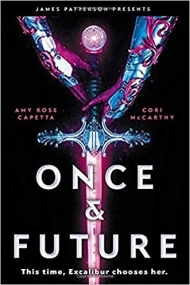 Final verdict: ONCE & FUTURE breathes new life into the legend of King Arthur in a fantastic new novel. With important themes, great characters, outer space, and magic, this delightful book is a great start to a new series. Infusions of humor and rebellion bring the well-known legend to a whole new time period and audience. This unique series is sure to be a favorite for lovers of crossover fiction, YA fantasy/sci-fi, comedy, and fairytale retellings.